Gametophytic plants pink to bluish-pink, forming soft, plumose bushes up to about 8 cm tall; attached by cylindrical stolons up to 2 mm in diameter; uprights comprising percurrent axis with dense determinate branches in all directions; basal parts of axes often stalk-like and without branches. 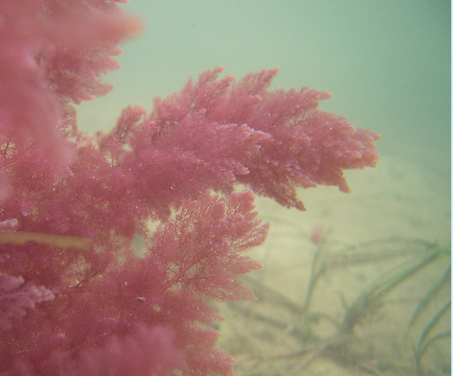 Tetrasporangial plants (“Falkenbergia” phase) forming tufts like pinkish-red cotton-wool, often entangled with other algae; thalli attached by multicellular haptera and comprising finely branched filaments with central axial cell and three pericentral cells; segments 30-40 µm diameter and 65-80 µm long at maturity; pericentral cells with a refractive, globular inclusion. 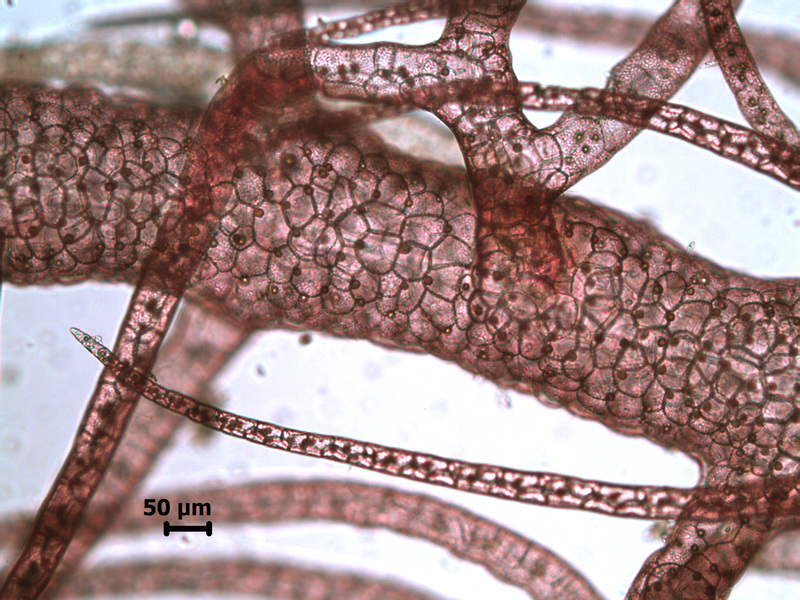 Tetrasporangia one per segment, replacing a pericentral cell, about 40 µm in diameter, tetrahedrally divided (see illustrations of Asparagopsis armata tetrasporophyte). 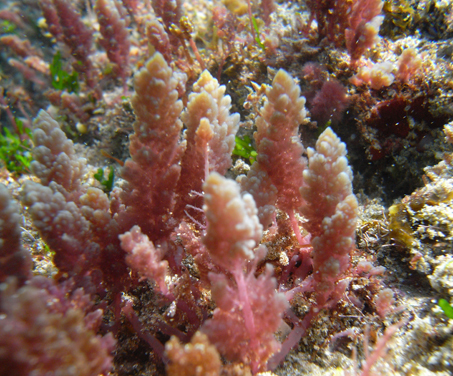 On the south coast, the gametophyte phase of an invasive Indo-Pacific lineage of A. taxiformis is recorded only from the Knysna Estuary, growing subtidally in shallow water in the small-boat harbour on Leisure Isle (Bolton et al., 2011). An Atlantic/Mediterranean lineage (Bolton et al., 2011)) of the same species is recorded “once from Scottburgh in central Kwazulu-Natal, but is common north of Cape Vidal” (De Clerck et al. 2005). World distribution: Found virtually world-wide in tropical and warm temperate seas (Guiry & Guiry 2009). Type locality: Alexandria, Egypt (Silva et al. 1996). Note: Tufts of “Falkenbergia” are common in the shallow sublittoral along much of the coast from False Bay to at least East London, and in northern Kwazulu-Natal. Because the tetrasporangial phases of A. taxiformis and A. armata (see later) are morphologically indistinguishable, the relative distributions of their Falkenbergia phases are uncertain, although current evidence indicates that “Falkenbergia” from False Bay to at least Tsitisikamma and probably to Port St Johns, is the sporophyte of A. armata (Bolton et al., 2011). Asparagopsis taxiformis, Sodwana Bay – specimens growing on exposed coast, but a different genetic strain to the Knysna plants. Asparagopsis taxiformis, single branch of Knysna specimen. Asparagopsis taxiformis, detail of Knysna specimen. Bolton, J.J., Andreakis, N., Anderson, R.J. 2011. 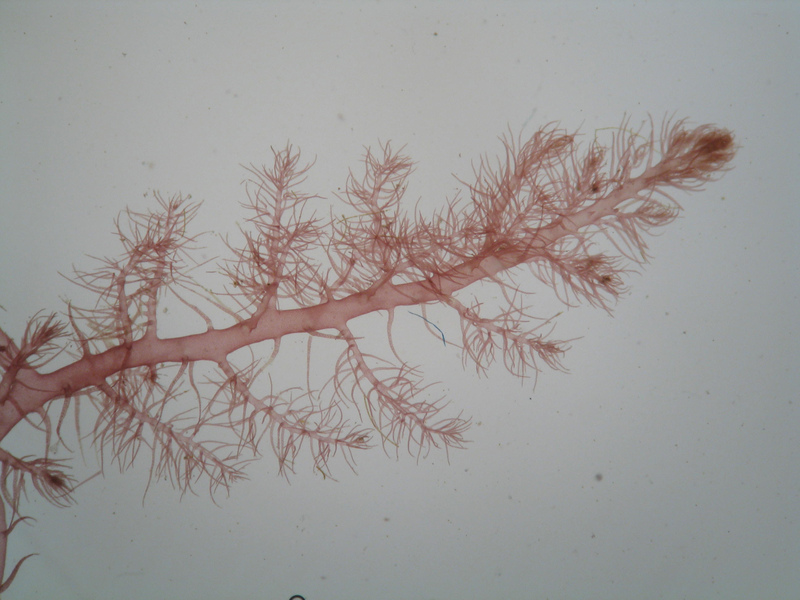 Molecular evidence for three separate cryptic introductions of the red seaweed Asparagopsis (Bonnemaisoniales, Rhodophyta) in South Africa. African Journal of Marine Science, 33: 263-271. Guiry, M.D. & Guiry, G.M. 2009. AlgaeBase. World-wide electronic publication, National University of Ireland, Galway. http://www.algaebase.org; searched September 2009. Trevisan de Saint-Léon VBA, 1845. Nomenclator algarum, ou collection des noms imposes aux plantes de la famille des algues. Vol 1, 10 pp. Padoue [Padova].